A clean and organized home leads to a more productive and fun life. But, if you're like many moms, you don't like doing the work it takes to actually get your home that way. Most often, the task just seems too overwhelming, and you don't know where to start. Thankfully, there's a way to make cleaning more enjoyable. That way is to have a plan! Pre-made schedules don't always work for everyone because there isn’t a one-size-fits-all schedule. We all have different homes, needs, and expectations when it comes to cleaning. Christine from I Dream of Clean has put together an easy step-by-step plan for you to create your own cleaning schedule that fits your lifestyle, your preferences, and your family. 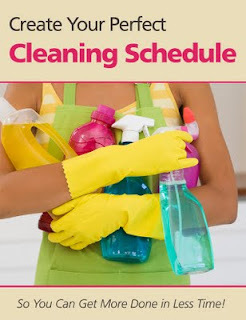 It will help you Create Your Perfect Cleaning Schedule! * Additional copies will be sold at the regular low price of $5.99. They will go fast so act quickly! Click here to purchase your copy of Create Your Perfect Cleaning Schedule, then visit the Perfect Cleaning Schedule Facebook Page (facebook.com/perfectcleaningschedule) to find PROMO CODES needed for the discount. Seriously I must admit most day I would need that book hehe!